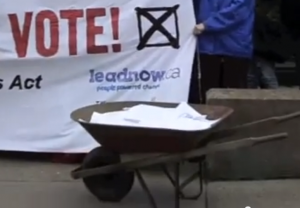 On Tuesday, March 25, we accompanied a large group from Leadnow and The Council of Canadians delivering our “Let People Vote” petition to your North Vancouver office. (A) Our petition included over 80,000 names of Canadians, many whom are outraged with the very UNfair Elections Act that your party is trying to ram through our parliament. While there is a lot wrong with what your party is proposing in this particular bill, our petitions are specifically asking your party to remove the parts of the new elections law that would suppress voting by young people, Aboriginal people and low-income people. 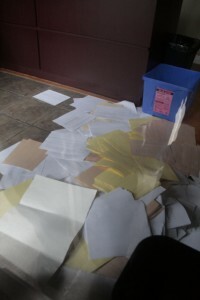 So there we were Mr. Saxton, en masse to hand deliver our wheelbarrow full of names to you. We took the time from our own busy day to come in person. We understand you were in Ottawa and we were sorry to have missed you. However, as a courtesy to you we had phoned ahead to let your office know we were coming yet you were unable to return the courtesy by having someone there to hear us out. We wonder, Mr Saxton, did you help your staff to plan an extended lunch break that day? As no one was at your office to speak with us so that we simply had to leave our petition on the floor of your office, we are writing this letter to tell you what we were unable to tell you or your staff in person. We want you to know sir, that as Canadian citizens we continue to be outraged. 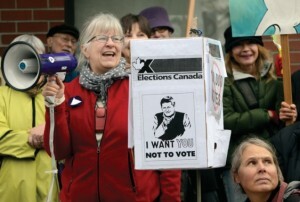 We are outraged at the arrogant stance that you and your party are taking in your refusal to listen to what we Canadians are saying about Bill C-23.Your colleague, Mr Poilievre, MP (Conservative, Nepean-Carleton) has refused to listen to or consult with non-partizan electoral experts such as Harry Neufeld (B), or even the chief electoral officer Marc Mayrand (C). Political science scholars across the country and even from abroad are writing to your party to express their grave concern with regards to what this act would mean for democracy in Canada and yet you march on, pretending that somehow this bill will make our elections more fair. (D) (E) Shame on you Mr. Saxton for being a part of this scam. Shame on you. Since your office was closed Mr. Saxton, we also decided to visit your website to see what you had to report to Canadians on the very important matter of your party’s plan to fundamentally and unilaterally diminish our democracy; to see what you had to say about how your party has re-written our election laws to dis-enfranchise thousands of Canadian Citizens; and to understand how you could justify having done so without consulting any of our respected electoral experts, scholars, provinces or citizens. Apparently democracy isn’t important enough for you, Mr Saxton, to open your doors, nor important enough to communicate to your constituents through your website. 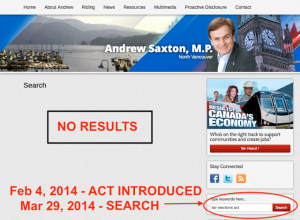 We used your own search engine Mr. Saxton – there was not one single occurrence of the “Fair Elections Act” on your website. Perhaps we should have searched for “UnFair Elections Act”? Our message to you Mr. Saxton is this – be assured that we will remember that your website was silent and your doors were locked when we came to discuss our concerns with you. You cannot pull the wool over our eyes. Canadians will vote on election day and weigh in on your refusal to listen to the people of this country. 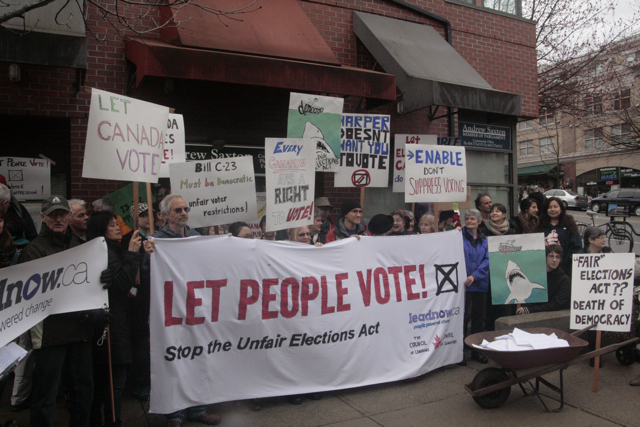 This entry was posted in Activism, Democracy and tagged #fairelectionsact, #unfairelectionsact, Andrew Saxton, Bill C-23, democracy, Pierre Poilievre by bgilgoff. Bookmark the permalink. Thank-you Betty for highlighting what is going on with the new Election Act. You have inspired me to become more informed on this issue. Glad to hear it Virginia. It is such an important issue and so frightening to watch our democracy being compromised. I’d certainly urge you to read more and talk it up with those around you. Canadians need to know! If Bill C-23 gets passed it is only going to get harder to get back what we lose. We need to stand up to this now. Thanks for your comment.